Brand Names You Can Trust. Add our store to your favorite stores and receive our exclusive emails about new items and special promotions! 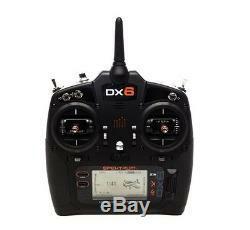 Spektrum SPM6755 DX6 6-Channel DSMX Radio Transmitter Gen 3 w/AR6600T Receiver. Brand New in Factory Packaging. In Stock Ships Within 24hrs. 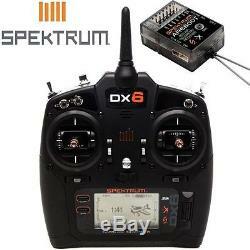 Spektrum SPM6755 DX6 6-Channel DSMX Transmitter Gen 3 w/AR6600T Receiver. Overview: The programming you need with nothing you don't. The DX6 has been designed from the ground up to deliver way more than you would ever expect from a 6-channel transmitter in its price range. Instead of having to content yourself with a handful of settings for a couple of model types, the remarkably affordable DX6 gives you an abundance of programming features for airplanes, helicopters and sailplanes. You also get other extras like voice alerts, a wireless trainer link and enough internal memory for up to 250 models. PROGRAMMABLE VOICE ALERTS With voice alerts, the DX6 will allow you to keep tabs on important functions without ever taking your eyes off what you're flying. They can be programmed to call out what flight mode you've chosen or report telemetry information on demand. If an alarm goes off, you won't have to look at the transmitter display to see what's happening. The DX6 will tell you. AIR, HELI AND SAIL PROGRAMMING In addition to its extensive airplane and heli programming, the DX6 includes an impressive list of programming features for sailplanes as well. Five available flight modes, 4 wing types, 3 tail types, a flap-to-elevator curve mix - it has all this and more. The intuitive SimpleScrollT programming interface makes all of these functions incredibly easy to access and use. WIRELESS TRAINER LINK The wireless trainer link gives instructors the option to wirelessly "buddy box" with another DSM2®/DSMX® transmitter. Once bound to another transmitter, ModelMatchT technology will allow the DX6 to re-link without having to go through the bind process again. 250 MODEL MEMORY The enormous capacity of the DX6's on-board memory means you will rarely, if ever, need to juggle models between transmitter memory and your SD card. The model memory menu is easier to navigate too. Only memory slots with model settings saved to them will appear. You won't have to scroll through empty slots or move models around if one is deleted. FLY SMARTER WITH BUILT-IN TELEMETRY The DX6 is equipped with a built-in telemetry feature that gives you real-time information on things like your model's battery voltage, signal quality, engine or motor temperature, airspeed, altitude and more. Using the voice alert system, you can program the DX6 to tell you when specific telemetry values reach or exceed limits you define. You can also have it call out a sequence of telemetry values on demand with the flip of a switch. If you want to review telemetry after a flight, the DX6 can be set up to record the data to its SD card. INCLUDES AR6600T INTEGRATED TELEMETRY RECEIVER The AR6600T receiver is a feature-packed, 6-channel receiver with integrated full-range telemetry. It comes with built-in connection ports for RPM, Flight Pack Voltage and Temperature sensors as well as an X-Bus port for additional telemetry options. No sensor is required to receive Flight Log or receiver pack voltage telemetry. The AR6600T also features a convenient Bind Button, making binding easier than ever before. Key Features: Dual antenna diversity Ergonomically designed case with comfortable rubber grips Programmable and customizable voice alerts Capable of storing 250 models on the transmitter, expandable further by saving on an SD card or PC ModelMatchT technology Direct System Menu Access mean there is no need to power off the transmitter to access all menus Supports Air/Heli/Multirotor/Sailplane model types Easy to use SpektrumT AirWareT software offers the same proven programming found in more expensive radios Ability to share models with any Gen 2 Airware Spektrum Transmitter Smooth, precise Four Bearing Gimbals AR6600T 6-Channel air integrated full-range telemetry receiver included Programming capability for most sailplanes, can support 4 Sailplane wing types and 3 tail types Supports the most popular Spektrum Telemetry sensors Includes 4 AA Alkaline batteries, optional Lithium Ion battery with charger (available separately) 5 programmable mixes - all mixes are selectable to be normal or 7 point curve multi-point mixes Dual Aileron, Elevon, and V-Tail Differential 7 aircraft wing types and 6 tail types 7 Swashplate types 7-point throttle (air and heli) and pitch curves (heli) Adjustable for smooth throttle and pitch curves Intuitive SimpleScrollT programming interface Advanced DSMX® technology (DSM2®? Compatible) SD card slot for updating firmware, expanding memory and sharing setups (SD Card is not included) Activate bind mode from the menu or a button without having to power off Specs. Band: 2.4GHz Channels: 6 Computer Radio: Yes Modulation: DSMX Range: Full Receiver: AR6600T included Telemetry: Yes. Please note: I will not put less amount on custom papers, so please don't ask. You can return any item in Brand New/unopened condition (within 14 days). The item "Spektrum SPM6755 DX6 6-Channel DSMX Radio Transmitter Gen 3 withAR6600T Receiver" is in sale since Monday, June 12, 2017. This item is in the category "Toys & Hobbies\Radio Control & Control Line\RC Model Vehicle Parts & Accs\Control, Radio & Electronics\Receivers & Transmitters". The seller is "power_hobby" and is located in Mahwah, New Jersey. This item can be shipped to United States, all countries in Europe, Canada, Japan, Australia.